They ran the car in 4th and 5th gear, rear wheel drive on a 2 wheel Dynojet. Interesting, I would have thought the car would be all pissed off if you tried to dyno it rear wheel drive. 436 horsepower - 430 lb-ft of torque in 4th gear. 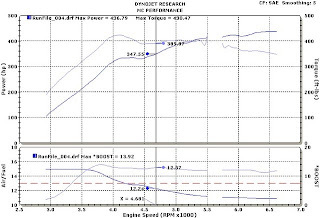 Peaking at 14 psi of boost , dropping down to just above 10 psi. Not too bad on power.